GUATEMALA CITY, (Reuters) – Guatemalan President Jimmy Morales yesterday showed signs of wavering on his decision to expel the head of a United Nations-backed anti-graft unit, who is investigating the leader’s campaign financing. Morales on Sunday declared Ivan Velasquez, head of the International Commission Against Impunity in Guatemala (CICIG), “persona non grata” and ordered him to leave the Central American country immediately. Hours later, the nation’s top court suspended the decision. After two days of protests in the capital and criticism from the United States and European Union, there were signs Morales could backtrack on his initial insistence that he had the authority to expel Velasquez. Government spokesperson Heinz Heimann said yesterday Morales was studying the court decision to suspend his order to force out Velasquez, saying the government would respect the law. “The resolution is being legally analyzed, respecting the rule of law, the laws and separation of powers,” said Heimann, who also “completely” ruled out rumors the government could declare a state of emergency due to the protests. It is not yet clear if Morales will challenge the court, a move that could put him in contempt and at risk of losing his job, according to constitutional experts consulted by Reuters. “Bring Jimmy Morales to justice!,” hundreds of students chanted in unison as they marched towards the presidential palace in downtown Guatemala City yesterday. Velasquez, who previously investigated drug cartels and paramilitary groups in his homeland Colombia, was declared “persona non grata” days after the CICIG said Morales should be investigated over alleged illicit funding in his election run. 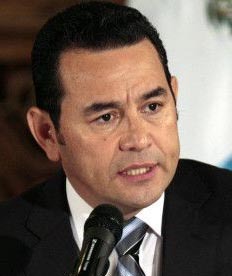 With powers to prepare crime and corruption cases, the CICIG was in 2015 instrumental in removing from office former Guatemalan president Otto Perez after identifying him as a key player in an alleged multi-million-dollar corruption racket. The CICIG has been strongly backed by western powers. 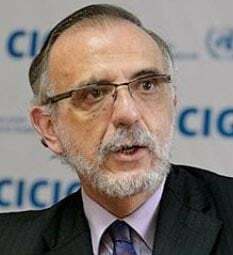 “We expect the Guate-malan government to allow CICIG to do its critical work without interference,” said U.S. Ambassa-dor to the U.N. Nikki Haley. The European Union said the decision to declare Velasquez persona non grata put at great risk the work initiated by the CICIG on strengthening the rule of law in Guatemala. Morales, a former comedian, won election in late 2015 after riding a wave of public discontent over the corruption scandals that brought down his predecessor Perez.